For a real treat head to the Arts Depot for a performance of "We're Going on a Bear Hunt", with performances on Saturday and Sunday (noon and 3pm). Adapted from the picture book written by Michael Rosen and illustrated by Helen Oxenbury. Join our intrepid adventurers on their quest to find a bear; as they wade through the gigantic swishy swashy grass, the splishy splashy river and the thick oozy squelchy mud! Expect catchy songs, interactive scenes and plenty of hands-on adventure - plus a few special surprises! For children aged 3+. This weekend is the Waterloo Festival 2013. The Festival celebrates Waterloo and its rich diversity past and present. There is a broad ranging programme including a community fête on Sunday promising fun for all ages with stalls, face painting, BBQ, Tug of war and Bouncy Castle. Fun for all ages! To view the full list of events click Waterloo Festival Brochure. The British Museum is holding a free, drop in, Digital Photography Mystery Trail workshop for Children 5+. Children can use a digital camera to explore the Museum's objects. Follow exciting photography trails through the galleries and then turn your photos into a comic strip to take home. The London Symphony Orchestra is running a family workshop for children under 8 from 10 am to 12.30pm. Join a musical circus with the whole family for a chance to meet LSO musicians. Try out instruments, take part in a gamelan workshop and make your own props to use in the concert at the end of the morning. Tickets are £3 (children) & £5 (adults). Babies under 12 months are free. The Saturday Show at Lauderdale House is "What's the Secret". For children aged 3 to 7 years. Sing and dance along with Grandpa Swede and all the other allotment vegetables. Learn to wiggle like a germinating seed, meet Growbot, the first vegetable-growing robot, and become part of the Secret Seed Society. Join in the imaginative and interactive journey following the life cycle of vegetables. Performances at 10am and 11.30am. The BBC Summer of Wildlife Day takes place at the Wetland Centre. There will be plenty of experts on hand all day to tell you about the fabulous creatures that live in the UK, with 20 wildlife organisations participating in this festival of nature. The day will include a whole host of walks and talks for you to participate in throughout the day including birdwatching walks, garden tours and reptile walks. There will be plenty for younger visitors to do too, from pond dipping and storytelling to wildlife trails and craft. If you fancy celebrating American Independence, head to Portman Square for the annual picnic. incredible music all day from classical, jazz, folk and rock bands. A plenitude of mouthwatering American and international food and drink will be on sale from a range of vendors. Children will be able to take part in supervised fun games and American themed activities planned throughout the day. Last year over 1000 people attended and even higher numbers are anticipated for this year’s party. Gates will open at 12pm. Celebrate the 1960s in style at London Bus Museum on Sunday 30 June 2013. This is an all-day event for all the family – the sights and sounds of the decade that brought us The Beatles, the Moon landing, Flower Power, mini-skirts and the Mini car, Radio Caroline, Star Trek, colour TV, the Summer of Love and the best music ever (depending on your point of view!). - See more at: http://www.londonbusmuseum.com/a-sixties-summer-sunday-30-june-2013/#sthash.oYH0PHH0.dpufThe London Bus Museum is holding a a Sixties Summer Celebration Day. This is an all day event for the family. The day includes displays of 1960's buses, cars and trams, live 1960s music with dancing, and children's activities. From 10 am to 5pm. This Sunday is the baby rave first Birthday Party from 3.30 to 5pm, at the Pirate Castle in Camden. Barnet Museum is holding a garden party. This event celebrates the 75th anniversary of the opening of Barnet Museum, on Wood Street EN5, with a garden party in the Museum grounds. The event will be part of the High Barnet Summer Festival and everyone is welcome, with a performance from ChoirsRUs. Entrance is free. Groovy Baby! 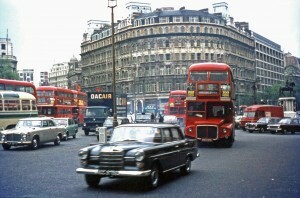 Celebrate the 1960s in style at London Bus Museum on Sunday 30 June 2013. This is an all-day event for all the family – the sights and sounds of the decade that brought us The Beatles, the Moon landing, Flower Power, mini-skirts and the Mini car, Radio Caroline, Star Trek, colour TV, the Summer of Love and the best music ever (depending on your point of view!). 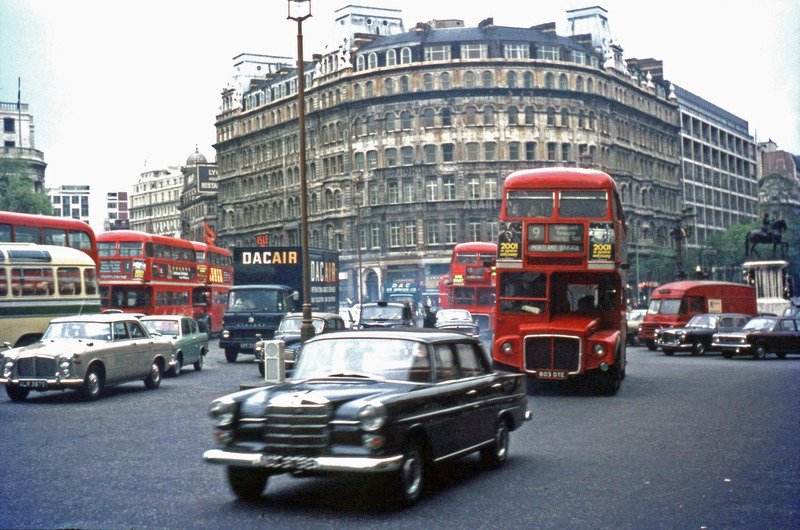 Trafalgar Square in the summer of '68. Fab cars and buses like these will be at "A Sixties Summer" on 30 June.